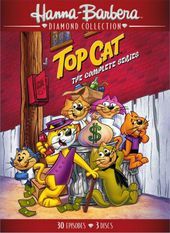 Top Cat, known as T.C. to his alley cat friends, is a mischievous prankster who lives in a trash can in the alley ways of New York City. He and his alley-cat cohorts think of get rich schemes and assorted pranks which are mostly involving and aimed at Officer Dibble, their nemesis and friend. T.C. manages to get out of his tight situations with hilarity and charm and even helps Dibble on occasion who is underscored by his overbearing sergeant.